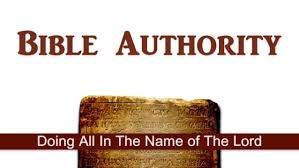 The subject of bible authority, is one of the most important subjects that there is when it comes to our faith, and to our conduct as Christians. But most people don’t realize and appreciate, just how important it really is. I think that one of the reasons for that is because most people don’t take individual verses and passages seriously enough. People read the scriptures, and even study the scriptures, but somehow they don’t seem to have the proper respect for the words they’re reading, and therefore they fail to grasp the concept, that those words amount to absolute authority, in governing our lives. So it’s really a matter of accepting that concept. I call it a concept, but what it really is, is simply the fact of the matter; The word’s of God are absolute! They indeed govern us, and like the bible says in John 12:48; “The one rejecting Me, and not receiving My sayings, has one judging him. The word which I spoke, the same will judge him at the last day!” Unless we come to a clear understanding, and acceptance of that fact, we won’t HAVE the proper respect for God’s word, and consequently, our faith will never be what it should be, and our Christian conduct will never be what it should be either. And possibly, our eternal destiny won’t be, what we think it’s going to be. These words that we read in our new testaments, are the very words that will judge us, on the last day. How could there be anything, any more important for us to understand, than the fact that our acceptance, or our rejection of the words of the new testament, will determine whether we spend eternity in heaven or hell? This sounds so simple and so straightforward, but again, the problem is that so many people, and I mean people who call themselves Christians; They don’t seem to have any respect for what that scripture says, or for what a lot of scriptures say. You either “receive” the scripture, and act upon it, in other words you OBEY it, OR, you don’t receive it, and you don’t obey it, and as a result, you “reject” Christ. It’s that simple. Almost everything in the bible is that simple, IF we respect what it says. It’s only when we DON’T respect what the bible says, that we have to start “interpreting” what it says. You see, it’s so easy for people to read a verse, like this one; “The one rejecting Me, and not receiving My sayings, has one judging him. The word which I spoke, the same will judge him on the last day”.. and then say; I don’t interpret it that way. But you’re deceiving yourself! It’s not a matter of “interpretation”, because the verse simply says what it says. The truth is that you don’t respect what that verse says, and therefore you simply refuse to believe it! Because IF you believe it, then you’ve just obligated yourself to obey what the entire new testament says. Let me remind you of two other verses from the new testament. First, Mathew 28:18, Jesus speaking; “All authority has been given to Me, in heaven and on earth.” No one else has one bit of authority to tell us what to do religiously, and even we ourselves don’t have the authority to decide what we will do religiously. Jesus has ALL authority, therefore, what He says goes, and nothing more! The next verse for us to consider, is Colossians 3:17; “And whatever you do in word or deed, do ALL in the name of the Lord Jesus, (that means.. by the “authority” of Jesus) giving thanks to God the Father, through Him.” Jesus has ALL authority. His words have the authority to judge us, therefore whatever we do, or whatever we say, needs to be according to HIS authority! Even what we think, needs to be according to His authority. Did you know, that Jesus has the authority to tell you what to think about? And He HAS told us what to think about! For example, He tells us, in Philippians 4:8; “..whatever is true, whatever is honorable, whatever is right, whatever is pure, whatever is lovely, whatever is admirable; If there be any excellence, and if anything is worthy of praise, think on these things!” THINK on these things! The meaning is to “dwell on these things”, to “consider these things”, and to “reason about these things”. These are the very things that Christ has authorized us to think about, and to dwell on, and to consider, and to reason about. Not other things, but “these things”! Now, let me ask you a question; What if someone said, “The bible doesn’t say we CAN’T think about other things that aren’t mentioned there.” Yes it does say you can’t! You are only allowed by God, to think about things that fit into those categories that were specified! “Whatever is true, and honorable, and right, and pure, and lovely, and admirable; And if there’s any excellence in anything, and if there is anything worthy of praise; Think on THESE things!” Does that not rule OUT, other things? Of course it does! The Lord wants us to be thinking ONLY, about certain things. And he has specified those types of things! God doesn’t have to make out a list of all the useless, and indecent, and immoral things that he doesn’t want us to think about. Because He has already told us what He wants our thoughts to be filled with, and anything else is forbidden! And that actually brings me to the title of this lesson. And here it is; “But The Bible Doesn’t Say We Can’t Do It”. People seem to have the very strange idea, that if the bible doesn’t give us an exhaustive list, of everything that we CANNOT do, then we are automatically allowed to do anything we want. But that’s a rather absurd conclusion. And it’s not at all rational. And we do NOT allow that kind of thinking to govern us, in any other area of our lives. Consider this example; You go to McDonalds, or Burger King, and you order a hamburger, with lettuce, tomato, and onion. And you get your burger, and you realize that they’ve put on it, lettuce, and tomato, and onion.. and ketchup, and mustard, and relish, and BBQ sauce, and mayonnaise, and guacamole, and maybe a few other things too. And you bring it back to the counter, and you tell them about all this garbage that they put on your burger, and they say; Well, you didn’t tell us NOT to put that stuff on there! And if you didn’t have a reasonable amount of self-control, you’d probably shove that hamburger in their face, because they didn’t tell you not to! What if you went to the hospital, for maybe a tonsillectomy, and while you were under the anesthesia, they gave you a face-lift and a nose job? Hey, you didn’t tell ’em not to! What if you went to the grocery store, and the checker rang up everything in your cart, and then they kept ringing up a bunch of other stuff that happened to be close by. And you said; Whoa! I didn’t tell you to ring up all that stuff. And the cashier says; Well you didn’t tell me not to! That doesn’t even make sense does it? So now, tell me how the bible is any different. Tell me how, when the bible tells us what to do, that all of a sudden that counts as permission to do everything that it hasn’t told us not to do. The fact is, that when the bible specifically authorizes something, then the addition of anything else is being forbidden. In Philippians 4:8, when the bible authorizes the very things that we are to be thinking about, and dwelling upon, it is also at the same time, FORBIDDING us to dwell on things that have NOT been authorized! When you ordered your hamburger, and authorized them to put lettuce, tomato, and onions on it, you were also FORBIDDING them to put anything else on it! This isn’t very hard to understand, is it? Here’s a really good example of what happens when you think that you’re obeying God, but you do something that wasn’t specified. Do you know what the “water of Meribah” is? “Meribah” means.. “contention”. And the “water of Meribah”, is the water that God made to come forth from a ROCK, when Israel had no water to drink in the wilderness, and they were angry, and contentious with God. God said; “Because you have believed Me!” When Moses took it upon himself, to use his OWN judgment, when God had SPECIFIED how something was to be done, God said; “You have not believed Me!” Wouldn’t the same also hold true for us today? I can’t see any reason WHY it wouldn’t. The new testament has specified that we remember our Lord Jesus, by coming together on the first day of the week, to partake of the Lord’s supper. Acts 20, verse 7 gives us the example of the church doing just that. And several verses specify using unleavened bread and the fruit of the vine, in remembering Christ. In specifying unleavened bread, and the fruit of the vine, ALL other ingredients are automatically forbidden! We’re told in Ephesians 5:19, to sing “psalms and hymns and spiritual songs”, in praise to God. We’re not told NOT to sing pop music, or country music, or classical music, because we don’t HAVE to be told not to! We’re told what KIND of songs to sing, and that rules out, all other kinds. We’re told in 1 Corinthians 14:26, to worship God through reading and teaching the WORD of God. But were not told NOT to praise Him, by teaching world history, or by reading popular science magazine, because we don’t have to be told not to do that. We’re told in 1 Corinthians 16:1 & 2; “On the first day of the week, let each one of you put aside and save, as he may prosper”. But we’re not told NOT to hold a bake sale, or NOT to sell hamburgers and soda pop in the parking lot, because we don’t have to be told not to. We’re told, what we’re supposed to do. We don’t have to be told everything that we’re NOT supposed to do. So then, in our worship of God, we’re authorized to sing and to pray. We’re authorized to give as we’ve been prospered. We’re authorized to read and teach the scriptures. We’re authorized to partake of the Lord’s supper. God has specified what He wants us to do. I could make a list, ten pages long, of all the things that God didn’t say, NOT to do. But what we need to be concerned about, is what God ahs authorized us TO DO! Don’t forget the example of Moses, who was “hand-picked” by God, to lead Israel for forty years. Yet he was forbidden to enter the promised land. Not because he didn’t do what he was told to do, but because he did, what he was not told, not to do! Think about that. He took it upon himself, to DO, what had NOT been authorized. 2 John, verse 9 says; “Anyone, who goes too far, and does not ABIDE in the teaching of Christ.. (that means you stick with what’s been said, not with what hasn’t been said) does not have God!” Anyone who does not limit themselves, to the authorized teachings of Christ, does not have God! That’s pretty plain. It says in Micah 6:8; “He has told you O man, what is good.” Everything that’s not on the list of “what’s good”, needs to be left alone! Abide in what’s good. Abide in what’s authorized, and you’ll be safe. Go beyond what’s authorized, and you’ll be like Moses, and you’ll be forbidden to enter the promised land. ← How Do You Perceive The Church ?